Animation World Network recently published an article of interest to fans of traditional 2D animation — and funny animals. 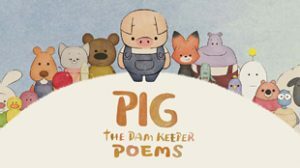 Tonko House has released a full episode of its new series Pig: The Dam Keeper Poems on-line for a limited time. If you don’t know what we’re talking about, here’s this: “Previously only available in Japan via production partner Hulu, The Dam Keeper Poems is based on the studio’s 2014 Oscar-nominated short film The Dam Keeper. Directed by former Pixar artists Robert Kondo and Dice Tsutsumi, The Dam Keeper tells the story of Pig, an introverted youth who lives in a windmill and keeps a dark fog from engulfing his town. Although socially rejected by his peers, he is befriended by the artistic Fox. The Dam Keeper Poems is a 10-episode series written and directed by Tonko House’s Erick Oh, who also served as Animation Supervisor of the original short film. Seen through Pig’s youthful perspective, with abstract and surreal visuals, the dialog-free series is centered around the friendship between Pig and Fox as Pig remembers how he became the Dam Keeper.” There’s a link in the article, but remember this is only available for a short while.